Also noted outbound this evening, another ship which had arrived yesterday. 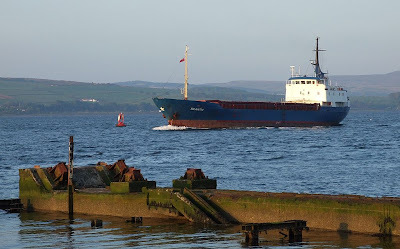 SKANTIC was seen as she passed Port Glasgow, her destination unknown as she was proceeding 'for orders' following a brief visit to Shieldhall. In the foreground is the extremity of the track where a 'Goliath' crane once operated, straddling the building ways of the Glen Shipyard, Port Glasgow.